The global modified atmosphere packaging market was valued at USD 11.18 billion in 2017 and is forecasted to reach USD 13.23 billion by the end of 2023 with a CAGR of 4.33% during the forecast period (2018-2023). The report is segmented by type of packaging gas used in modified atmosphere packaging, such as oxygen, nitrogen, and carbon dioxide, among others and by end-user application, such as convenience foods, poultry, seafood & meat products, bakery & confectionary, and fruits & vegetables, among others. The regions considered in the report include North America, Europe, Asia-Pacific, Latin America, and Middle East & Africa. Packaging is a crucial part of food processing, manufacturers are gradually adopting innovative ways of improving the shelf life of products without compromising on taste, nutritive value, and food safety. To handle such challenges, innovative packaging solutions like modified atmosphere packaging plays a vital role. Modified atmosphere packaging is considered as a revolutionary advancement in food packaging, which is mainly used to extend the shelf life of perishable products. Hence, this type of packaging is quickly gaining traction among the food manufacturers and end-users. The growing demand for ready-to-eat food items in the developing economies, hygienic packaging of products, and longer the shelf life of products are driving this market. Transforming lifestyles of the global population has resulted in changes in consumer preferences. Food packaging industry has grown drastically in the last decade. Globally, consumers have realized the advantages of food packaging and are increasingly adopting these products. Customers look for products that have long shelf lives so that food remains fresh for consumption. Also, the consumers are looking for products that are free from preservatives and other harmful substances which enhance shelf life. Thus, the demand for a MAP for foods is bound to surge in the forecast period. 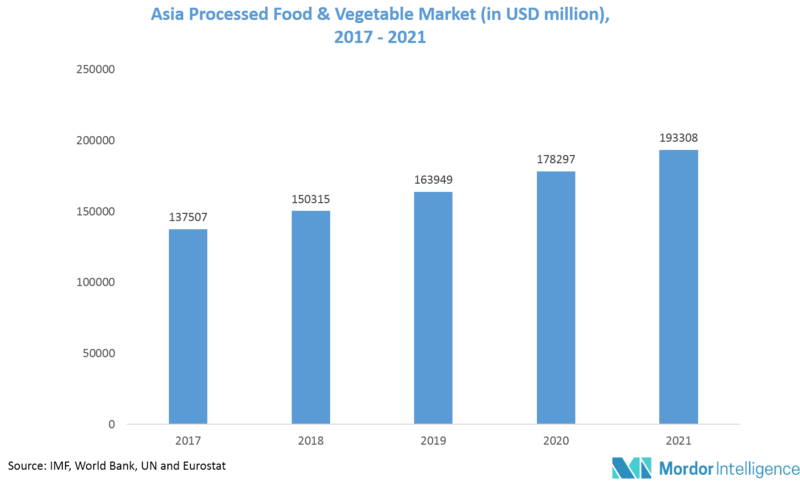 The processed food & vegetable market in Asia-Pacific was estimated to be USD 137,507 million in 2017 and is expected to reach USD 193,308 million in 2021, growing at a CAGR of 8.9%. Canned fruits & vegetables are the primary drivers of this segment, owing to their high demand in the market. If packed usually, these products may last only a few days, as chopped fruits and vegetables turn brown. Modified atmosphere packaging can have a dramatic effect on the browning of cut fruits and vegetables, which is a result of oxidation reaction brought by the release of enzymes. In these cases, having a mixture of nitrogen and carbon dioxide in packaging with no oxygen can prevent browning for several days. This could increase the shelf life of the product to as long as eight days, whereas under air it would remain fresh for four to five days. Furthermore, consumer health consciousness, health benefits, and competitive prices of food products are the key influencers that are making this market to grow lucratively. Feb 2017 - LINPAC has teamed up with specialist films manufacturer, Klöckner Pentaplast, to create a resource efficient modified atmosphere pack (MAP) for fresh perishable food and liquids. Jan 2017 - Multisorb Technologies launched MAPLOX program, which is a low-oxygen packaging solution allowing case-ready products to be packaged centrally and distributed in a retail ready format. Major Players: Air Products and Chemicals Inc., Coveris Holdings S.A., Praxair Inc., Sealed Air Corporation, Bemis Company Inc., Berry Plastics Corporation, and Amcor Limited, among others. 7.9 Robert Reiser & Co. Inc.